Les ménages ayant des membres scolarisés supportent une dépense moyenne d’éducation par élève de 1021 DH par an pour les enfants ayant un niveau fondamental, 1987 DH par an pour les enfants au secondaire et 3217 DH par an pour les personnes ayant un niveau d’études supérieur. Par ailleurs, la dépense moyenne d’éducation par personne scolarisée croît avec le niveau de vie des ménages. La dépense annuelle moyenne par personne scolarisée pour les élèves issus de la classe des 20% les plus aisés est de 3491 DH alors que celle des élèves du premier quintile est de 366 DH. […] En réponse à Horani, Akesbi précise que la pression fiscale ne représente que 22 à 25% au Maroc (il n’a pas décliné sa méthode de calcul) et que à ce titre, il est hors propos de demander des baisses d’impôt. My Hauser boundary would at first glance contradict official figures from say, Bank Al Maghrib or the MINEFI. It would also contradict a statement from Prof. Akesbi, who puts his figure for fiscal pressure around 22-25% of GDP, which is probably true for the last three or four years, if all receipts except new borrowings are taken into account. It seems Bank Al Maghrib in the predictions laid in their 2010 annual report have made a similar assumption that public finances have been at their best in 2008 (a historical surplus in the Budget is indeed a plus) and the 24.2% should, if I am not mistaken, point to the total receipts (barring borrowings) relative to GDP. Unfortunately, both Prof. Akesbi and the BKAM team have missed the point of genuine fiscal pressure; the percentage is supposed to measure the treasury’s extraction of resources relative to wealth creation. I do not buy into their argument for two reasons: first, the percentage itself provides little explanation as to its individual component, chief of which the contribution of taxes on Capital and Labour, and second, it gives disproportionate importance to various sources of treasury income with no immediate link to government and budget policy. The economic argument, the fiscal pressure should be computed so as to discuss the effects of distortionary taxes, and only then look at other lump-sum type of taxes, but certainly not pay too much attention to the miscellaneous receipts the treasury cashes in from the government’s portfolio, privatization or other minor sources of income. The historical record is quite simple, if surprising. 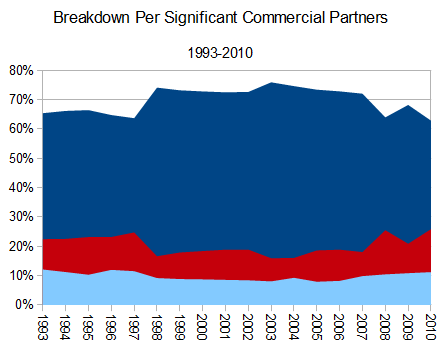 Not matter what the tax rates have been, in postwar America tax revenues have remained at about 19.5% of GDP. This is a lesson Congress should remember as it considers President Clinton’s proposed tax hikes. If history is any guide, higher taxes will not increase the government’s take as a percentage of the economy. In relative size, the last decade has seen Morocco’s effective, “Hauser” fiscal pressure hover around 18.2%, the lowest effective rate since the days of fiscal conservatism and austerity of the Structural Adjustment Plan of 1983-1992. Distortionary vs Lump-Sump: VAT is a distortionary tax, and so is Income tax. stamp duties and local government taxes, more likely to be lump sum taxes. The difference is two-fold: first, lump-sump taxes do not affect economic decision-making. Because economic agents are assumed to behave in a rational fashion, their optimized decision equate marginal effects, which means constants such as the lump-sum tax do not enter into account. This is perhaps why economists prefer them. On the other hand, these taxes are very unfair to the poorest and less-endowed economic agents. Proportional or quasi-proportional taxes are said to be ‘fairer’, but at the same time, they alter, or distort, economic calculations. In size as well as in importance, distortionary taxes are worth the study, while lump-sum taxes are a secondary element that need not be involved in the way described above. 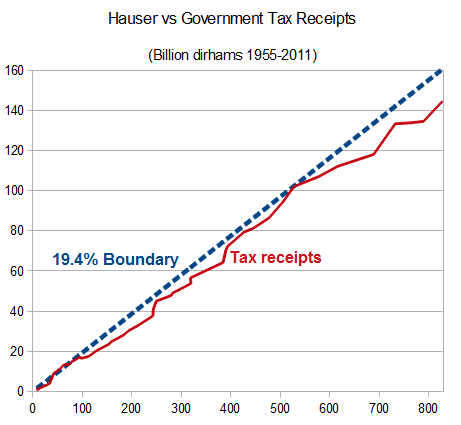 the Hauser boundary evolves around 19.2% and 19.4% of GDP. This means fiscal policy has little impact on government’s fiscal pressure over the economy. Some of the computations I present the reader with are built on a very strong assumption, almost a dishonest one: the only available data time series I could put together involved government expenditure, and not taxation. What you see really is government expenditure relative to GDP. My assumption postulates the primary balance is stationary around zero, i.e. government expenditure is almost fully funded by tax receipts. It is a strong assumption indeed, but some results from empirical data tend to vindicate yet again that assumption. The years 1976-1979 stand out as a bit odd, because there was a primary deficit back then for obvious, historic reasons: huge transfers to the newly recovered Southern provinces, and a rapid expansion of Morocco’s military capacities have put a strain on its public finances. Besides, even though Morocco’s GDP grew at very high rates, it was not economic activity that pulled it off, and that might explain why it did not translate into additional tax receipts. Barring these 3-4 years, government expenditure and main tax receipts are not statistically significant, when one takes into account for instance the GDP deflator. For reference, I compare my expenditure-turned-tax receipts against the World Bank’s nomenclature GC.TAX.GSRV.CN and GC.TAX.YPKG.CN. The assumption about the primary budget balance is one of long-term consequences: no country can afford a deficit in its primary balance, i.e. not fund its daily expenditure with taxation over a long period of time. 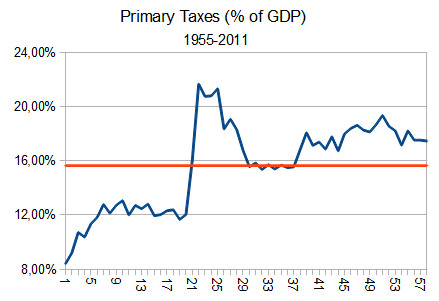 This is particularly true for the past decade, where a primary surplus of 0.1% relative to GDP, on average, has been observed – this figure is merely the difference between distortionary taxes and government expenditure relative to GDP, and shows the long-term behaviour of public finances: primary taxation funds entirely government expenditure. In the realm of public finances, and with no loss of detail, labour taxes are levied on income, consumption-oriented goods and services (typically, VAT) while taxes on Capital are usually centred around corporate tax (a tax on profit or in accounting terms, operating margin). When one considers fiscal receipts from the last 20 years however, this does not seem to be the case: Capital is over-taxed, and Labour under-taxed. There are many ways to explain these discrepancies, both at the aggregate and input levels: first, fiscal policy in Morocco does not seem to take into account the repercussions of its implementation, meaning that the various tax breaks, deductions and even the new fiscal measures fail to anticipate the behaviour of agents subject to these fiscal regulations. This is not a new phenomena, really: if indeed the Hauser boundary is verified, fiscal policy, translated into fiscal receipts, appears to exhibit higher levels of volatility -almost twice as much as GDP’s, though the trend observed since the mid-1990 points to a stabilization close to GDP fluctuations. The second point about these discrepancies is policy-making: the figures in this post fail to account for the differences in fiscal regulations, especially those pertaining to agricultural output, whose tax system has been frozen in effect since the mid-1980s. The same fiscal regulations miss out on the upper income bound due to the standard income tax, whose marginal rate actually falls when it comes to the top decile income earners. In policy terms, income rates have been too low, or inadequate. The same can be said of consumption-based taxes, such as VAT. As for corporate taxes, though the effective tax rate is comparatively low, the receipts are not up to scratch, in terms of Laffer Curve, corporate taxes are not efficient, and need to be cut accordingly. To make up for the shortfall and to balance the fiscal ratio up, wealth tax and the agricultural tax need to be levied at some point. in 1955, Morocco’s GDP ranked in the bottom 12% out of 72 countries. in 2009, Morocco’s GDP ranked in the bottom 32% out of 190 countries. This is good news: it can be argued that Morocco’s catching up to the global mean is real and tangible, and that is has done well over half a century by lifting itself up from poverty to average, the performance has to be put in perspective: the distribution of global GDP has changed dramatically: it has grown more unequal, and the seemingly bimodal shape of the density estimate in the graph belies the large number of countries left behind the curve, literally. The “bimodal shape” refers to the two humps observed in the light-grayish curve of Real GDP Per Capita for 2009, one close to 6 – 8, which refers to a Real GDP Per Capita of $1,200 and $1,500, and a wealthier hump of $13,000 to $17,000. Morocco’s performance puts it in the vicinity of the upper bound of the first hump, with about half as much, in current terms. In 1955, discrepancies between countries were not as striking; on the other hand, there were only 72 countries whose individual economic data were recorded. Nonetheless, distribution was very close to a theoretical normal distribution, with average Real GDP Per Capita around $ 476.24 (in current prices) and about 95% of all values between $478.3 and $474.2, what is more, countries in the left hand-side tail, the richest countries are quite rare, if any. Morocco’s Real GDP Per Capita ranked in 1955 around the bottom 12%, close to the lower decile that is. As usual, going from small A to larger B does not necessarily mean we have scored good. It is true Morocco has grown about an average full percentage point above worldwide trend, but is it enough? Or is it even statistically significant? where high growth is not enough: world GDP is more likely to stick to its average growth figure, while Morocco has a higher likelihood to dip into negative growth figures. 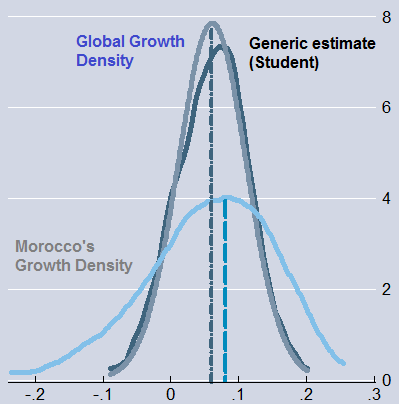 Growth in Morocco is definitely more volatile: even as its mean is significantly higher, the standard deviation is about twice as large as the average global growth. Indeed, if it was not for the large differences in growth levels, Morocco could have improved its standing in the global percentile. 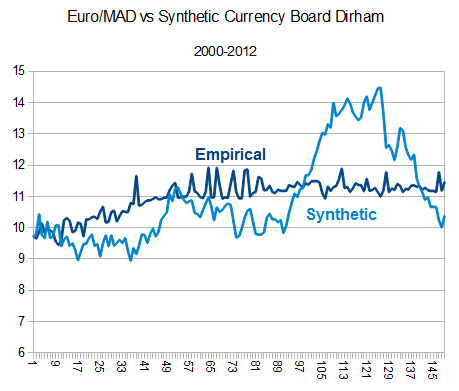 in short, the Moroccan economy hasn’t done enough in terms of β-convergence (the maximum growth rate to catch up to more advanced economies) and has definitely failed to generate enough in terms of σ-convergence (the ability to achieve growth rates without too much volatility through redistributive growth). It is not too harsh a statement: after all, volatility around growth levels for the past decade has been cut by 15% relative to the 50-years long trend, and 20% when compared to pre-1999 levels. What happened was, the economy did not push stronger in achieving more in reducing volatility. At this stage, the argument that maximum growth doctrine, even if it has been achieved at some level by the Moroccan economy, did not generate the anticipated level of wealth and income per capita. This might explain why even as Morocco has improved its ranking by jumping two full deciles, it is not nearly enough to qualify as a true emerging market with upper-middle income potential; simply put, Morocco was lucky enough to improve its ranking because other countries have messed up their development model – check the lower right hand-side tail to verify: it is no good to boast a 30% bottom when the said 30% are much poorer. The alternative way to go might reside in a little-known and seldom advocated policy, that is, to achieve the lowest possible volatility over an intermediate or long period of time. 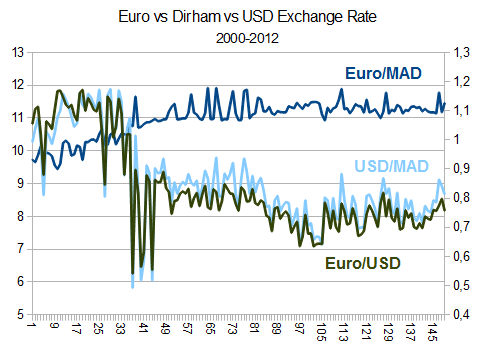 Consider a generic Moroccan economy, where everything runs smoothly with no volatility, i.e. a stable economy with the same growth rate of 5.655% every year from 1961 to 2010, which is the exact average growth of real GDP Per Capita over the same period of time. GDP Per Capita is expected to grow 16.5 times in 50 years, which means GDP per capita (current US$) would reach $3,871.57 instead of the existing $3,053.53 per capita. The generic economy has run on the same growth rate, the same population, but there is one crucial factor that explains the $818 gain per capita (or the aggregate sum of $ 26.7 Bn, or 213 Bn dirhams) and a notch higher toward the $ 4,036 Upper-Middle Income Countries per World Bank nomenclature. 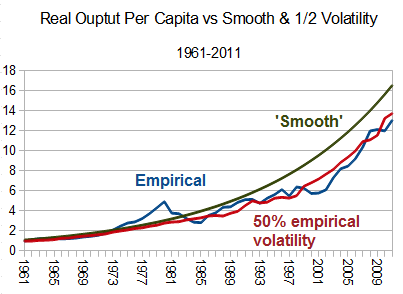 In fact, there is a way to quantify the gains from any policies designed to reduced output per capita volatility. A completely ‘sanitized’ growth brings increases GDP Per Capita by $ 800. 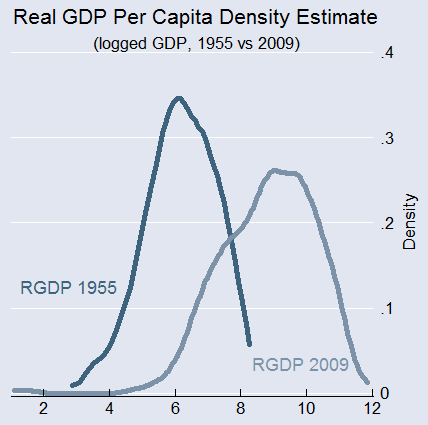 Halving output per capita volatility by 50% means growth gains would amount to $160. This shows growth stability is not an easy target to achieve, and the potential benefits have long-term effects, but it is clear the σ-convergence path has more benefits to the Moroccan economy. Unfortunately, growth volatility in Morocco has been followed by a proportionally larger drop in average output per capita – even as demographic growth dropped too, so this is, up to less than a percentage point, the economy’s entire responsibility. There is room for the next years to generate an additional $160 per capita if growth volatility is cut in half. The political argument for a more stable growth is more difficult to make: no political party or organization would advocate moderate growth rate for higher stability. Elected representatives cannot produce electoral manifestos without ambitious growth rates: recall PJD’s pledge to increase GDP Per Capita 40% by 2016, which means they need to achieve an annual growth of 6%, or 7% when demographic growth is taken into account. The unelected officials need to promote a narrative whereby Morocco is a dynamic, Mediterranean Dragon, and potential growth rates of steady 5% do not look terrific when sold to foreign investors. Come to think of it, this is the actual cost of development policies in Morocco: these should have at least alleviated the effects of volatility. Instead, some have only exacerbated them, to the tune of 213 Bn dirhams of lost development.